This map is the detail / large scale map. My KMZ of the small scale map is available here. 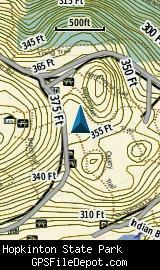 This KMZ map is set to Draw Order 28 so it will show 'beneath' your primary map on your Garmin KMZ-compatible GPS. 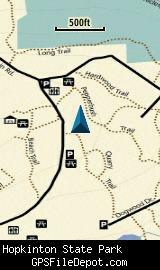 It will show over my small scale map of Hopkinton State Park (as described above) but under my KMZ map of the Ashland Town Forest. 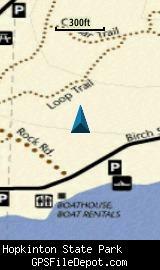 All of the images below are from a Garmin GPSMAP 78sc. The image on the left in each row is with no other maps displayed. 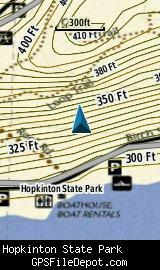 The image on the right is with the Garmin 24K NE series TOPO map displayed.